I'm glad, I saw Drogba play this year. I'll try attend another game next year as he retires. semipenguin and IndustrialH like this. I'm seeing different articles he will retire next season and now he his hanging up his shoes. Either way, if he decides to retire this year. I'm glad, I was able to see him in his final game in Phoenix. I'll eventually catch another game next year and hopefully, legends Omar Bravo and Shaun Wright-Phillips will be playing. Even though Phoenix Rising FC isn't in the running for the top contenders slots for the 2017 expansion. They have been asking the fans to design the 2018 scarf, I like #2 which I voted for. 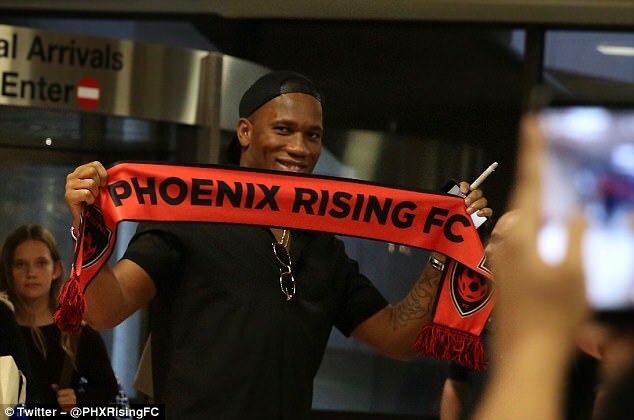 Here what the 2017 scarf looked like, I bought one and not because Drogba showing it off. I'm starting to watch some MLS games on TV and there one team I'm a fan of and that the Houston Dynamo. So, I watched the Dynamo vs the Seattle Sounders leg 1 match and unfortunately, Dynamo lost 2-0. They will need a miracle to win leg 2, especially in Seattle. The previous round was a bit confusing to understand. Since when Dynamo was playing against the Portland Timber and leg 1 finished in a tie, but leg 2 Dynamo won 2-1. But was interesting if the game finished in a tie again. Dynamo would have advanced because they had more goals? But either way, they won that game. But either way these leg 1 and 2 games are kinda confusing if both teams finish in a tie and they do a breakdown on who has the advantage to advance. I would just simply go penalty kicks, until somebody scores. Plus I do like the first round a simple knockout round. The level of scrutiny required to determine a winner indicates that the sport is fundamentally flawed. Is that how they do it in the European leagues? I know we won't see it the states. The pyramid structure for soccer leagues. If a team wins there championship, they moved up and vice versa for a last-place team. They seriously need to fix MLS to connect it to USL and NASL. In European Football, each round is two matches. One at home. One away. Away goals mean more than home goals. So if both matches end in a draw, the club that has the most away goals will advance. Make sense, sounds like what MLS rules go by and I did hear away goals for Dynamo. I almost asked "what do they do when they have the same number of away goals?" but then I remembered I don't care. IdRatherBeSkiing, Wolf, HecticArt and 1 other person like this. For that comment, meme should get a red card. memebag, HecticArt and semipenguin like this. Come on Dynamo, defeat the Seattle Foghorns or whatever a Sounders is? This is a mini tournament that takes places mainly in Tucson, mostly MLS clubs does participate in it. But 3 games will be played in Phoenix. Phoenix Rising FC will play against TBD, Colorado Rapids and Sporting Kansas City. All in February, I may try and check out one game. Plus it could be a possible future preview of a MLS game in Phoenix. I found out that Phoenix Rising FC lost a couple of veterans Peter Ramage and Jordan Stewart decided to leave the team. Shaun Wright-Phillips and Omar Bravo are undecided, and this will be Didier Drogba last year of playing. But with these veterans leaving, Rising FC has been signing some new talent and couple are from the USL San Antonio team and the fans over there are not happy. They can start cheering for the Austin Crews. I bought my tickets today, so I will see Phoenix Rising FC play against an MLS team in February. There were some rumors that Phoenix Rising FC would be signing some intresting player, Solomon Asante. NEWS: Ghanaian International Solomon Asante Joins Phoenix Rising. He'll be reuniting with Gladson Awako and Patrice Carteron, who were formally with Congolese side TP Mazambe.